Eye Logic dry eye spray is formulated to maintain normal eye health. 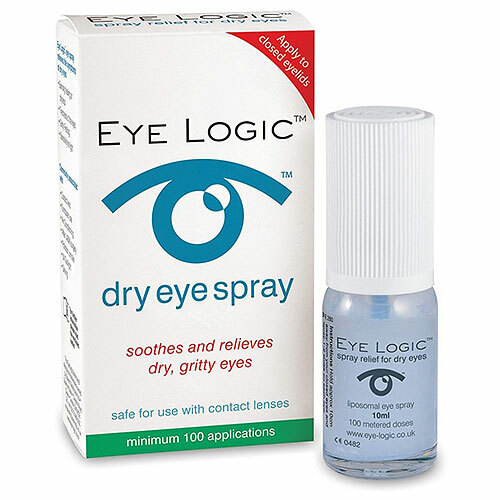 Eye Logic dry eye spray is a safe, easy to use product that treats a deficiency in the lipid layer of the tear film - the major root cause of dry eye syndrome by improving the lubrication of the eyes and eyelids. It has a revolutionary spray delivery system, you simply spray onto closed eyes. Ideal for contact lens wearers. Soy Lecithin, Sodium Chloride, Ethanol, Phenoxyethanol, Vitamin A palmitate, Vitamin E, Purified Water. Hold approximately 10cm (4 inches) away from your closed eyes and spray 1-2 times on each eye - you will feel the full effect in 3-4 minutes. Use for up to 6 months after opening. Please refer to Instructions for use leaflet. Eye Logic eye spray should not be used in the presence of hypersensitivity to one of the ingredients. The bottle may also be used by several persons, since there is no contamination. Eye Logic eye spray should not be used simtultaneously with eye medicine. Below are reviews of Eye Logic Liposomal Eye Spray - 10ml by bodykind customers. If you have tried this product we'd love to hear what you think so please leave a review.